High Frequency X-ray Variability of Stellar Mass Black Holes. Black Holes are the most extreme objects we can study in the universe. X-ray observations probe the regions closest to the black hole event horizon, beyond which nothing can escape. Oscillations (QPOs) in the X-ray flux with frequencies of hundreds of Hz have been found by RXTE. These can only be produced in the immediate environs of the event horizon. Black Holes curve the space-time around them in a way described by Einstein's General Theory of Relativity (GR). By studying these QPOs we can test this theory at its extremes in a unique way. GR predicts that only two parameters, the black hole mass and spin, control how space-time is curved by the black hole. This is the famous "no hair theorem" for black holes. RXTE observations have found the highest frequency QPO from a black hole, at 450 Hz (from GRO J1655-40, a Galactic microquasar which also shows relativistic jets in the radio band). The mass of this black hole is known from optical studies of its orbital dynamics. The high frequency QPOs suggest that it must be a spinning black hole. See the paper, "Discovery of a 450 Hz QPO from the Microquasar GRO J1655-40 with the Rossi X-ray Timing Explorer", for more details. 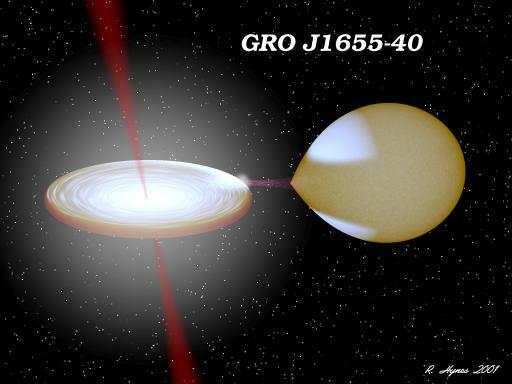 The image below is a depiction of what the binary system containing the black hole GRO J1655-40 might look like if you could see it up close. The material which is accreted by a neutron star in a binary system builds up in a thin layer on its surface. Over several hours enough material can be accumulated so that near the base of this layer it is hot and dense enough to initiate thermonuclear reactions amongst the Hydrogen and Helium nuclei. These reactions can occur in an unstable manner which causes strong heating of the neutron star surface. This heat energy produces brief flashes, or bursts, of X-rays from the neutron star. Usually such flashes only last about 10 - 20 seconds, however, a new type of X-ray burst behavior has been found in the last few years, which lasts for hours not seconds. These very long bursts are called "superbursts," and they are caused by thermonuclear burning of a much thicker and deeper layer of accreted material than that which causes the 10 - 20 second bursts. The layers responsible for the superburst are made up of the "ashes" of the light element fusion which takes place above it. It takes years for enough ash material to build up, so these events are quite rare and only seven have been observed so far. Our group has observed two of these superbursts with the PCA on RXTE. The figure below shows the X-ray intensity profiles from these superbursts, one from 4U 1820-30, the other from 4U 1636-53. 4U 1820-30 is an ultra-compact binary system with an orbital period of only 11 minutes. The entire binary system would easily fit within the Sun. The image below left shows a rough scale model of the system. The Earth and Sun are shown to give an approximate idea of the size of the system. The companion star in this system is a Helium white dwarf. The nuclear fusion of this Helium produces a lot of Carbon, which is a likely fuel for the superburst seen from this object. See the paper, "A Remarkable 3 Hour Thermonuclear Burst from 4U 1820-30", by Dr. Edward Brown (University of Chicago) and myself for all the details. The superbursts provide a tantalizing look at the surface and deep "ocean" of neutron stars. We also discovered spectral lines during this superburst. These spectral features could be caused by reflection and reprocessing of the burst flux from the accretion disk in 4U 1820-30. Observations of superbursts with much higher spectral resolution could provide new methods to probe both the accretion disk and the neutron star itself. A new way to do this could be to use the Swift Gamma-ray Burst Mission as a trigger for Target of Opportunity (TOO) observations. 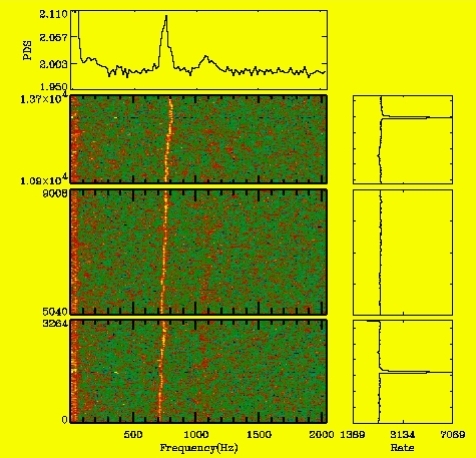 The figure below shows the spectral features seen during the superburst from 4U 1820-30. Millisecond X-ray Variability in Accreting Neutron Star Binaries. In February, 1996, a few months after the launch of RXTE, our research group discovered extremely rapid variability in the X-ray emission from accreting neutron stars. Some of the oscillations we have discovered occur at frequencies greater than 1,000 cycles/sec, or Hz, and are the most rapid periodic variations yet observed from cosmic sources! We use these observations to learn about neutron stars and black holes. The image below shows some of these high frequency, quasiperiodic oscillations (QPO) in 3 orbits of data obtained with the PCA from the low mass X-ray binary (LMXB) 4U 1728-34. The high frequency quasiperiodic oscillations (QPO) show up as a pair of nearly parallel orange lines running up the image. The QPO frequencies also increase as the X-ray intensity increases. For more details follow the link to "Millisecond X-ray Variability from an Accreting Neutron Star System" . Using RXTE we discovered that during thermonuclear X-ray bursts from neutron stars the X-ray intensity can oscillate at very high frequency. An example of these oscillations is shown in the image below. Like the one above, it gives a representation of the X-ray time variations, but only during an X-ray burst from the neutron star binary 4U 1702-429. The white trace shows the X-ray intensity during the burst. The oscillations show up as the red, blue, and white region, and in this object the oscillation frequency is about 330 Hz. Using these data we have found evidence that the observed frequency represents the rate at which the neutron star spins. Neutron stars are the fastest spinning stars known. Recently we have found that not only short 10 - 20 second thermonuclear bursts have oscillations, but superbursts do as well. Oscillations during bursts from the neutron star binary 4U 1636-53 at 581 Hz were found by Will Zhang and his colleagues in 1996. Recently, with Dr. Craig Markwardt I have found that such oscillations are also present during the superburst seen from this object with RXTE/PCA. See the paper, "Evidence for a Millisecond Pulsar in 4U 1636-53 During a Superburst", for all the details. The figure below shows a representation of the superburst oscillations. The upward drift in the frequency is caused by the orbital motion of the neutron star. During the superburst the oscillations can be seen for much longer than during short bursts. Studying the properties of X-ray bursts and the oscillations which occur during them allows us to obtain new information about the properties of neutron stars. 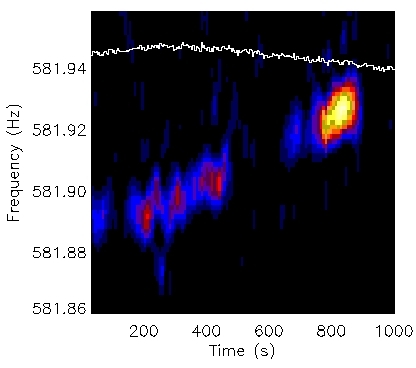 If you are interested in more details, you can follow the links below to several papers which explain the properties of oscillations during X-ray bursts. Here is a paper which reports the discovery of a neutron star near the Galactic center with 589 Hz oscillations during bursts, the 589 Hz burster . Here is a paper which describes the stability of the oscillation frequency in bursts from the same source over several years, the long-term stability of burst oscillations . This paper describes how strong the oscillations in bursts can be, the amplitudes of burst oscillations . Here is a paper which describes the quality of the oscillations and how the oscillation frequency changes during a burst, the high coherence of burst oscillations . Recently, oscillations during a burst were seen to slow down. This gives us a clue as to what process causes the oscillation frequency to change during a burst, the paper on spin-down of the oscillations in a burst . Here is a recent review article based on a summary talk I gave at the X-ray Astronomy 1999 conference, September, 1999 in Bologna, Italy. Oscillations During Thermonuclear X-ray Bursts: A New Probe of Neutron Stars. A neutron star can spin so fast that the rotational velocity can approach a significant fraction of the velocity of light. This can produce interesting effects on the pulse profiles and spectral Doppler shifts which can tell us about the size of the neutron star. This short paper describes Searching for Rotational Doppler Shifts during burst oscillations. SGRs are rare, repetitive sources of very intense hard X-ray flashes. There are four such sources currently known, and they are all associated with young supernova remnants, neutron stars and point like X-ray sources. 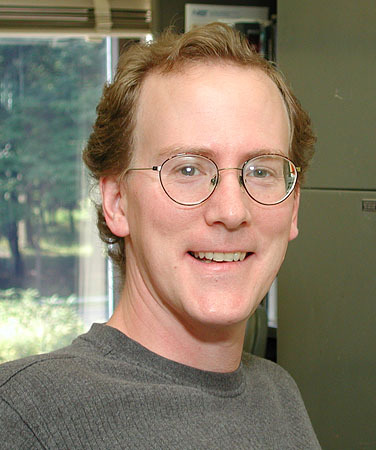 A nice resource for background information on SGRs is Robert Duncan's Magnetar webpage. The connection between neutron stars and SGRs was suspected for many years, however, it was only recently with the advent of RXTE that new breakthroughs were made in our understanding of the SGR sources. The large collecting area of the PCA detectors aboard RXTE provided the sensitivity required to discover that the SGRs are rapidly slowing X-ray pulsars. The rapid rate at which they are spinning down is strong evidence for a super-strong magnetic field in these neutron stars. The magnetic field estimates give a field strength ~ 1014 gauss, by comparison, the Earth has a magnetic field strength of ~ 1 gauss. The magnetar fields are the strongest magnetic fields known in the universe. Take a look at the Magnetar discovery story which describes the discovery of an X-ray pulsar associated with SGR 1806-20 . Read the story about the enormous SGR burst from SGR 1900+14 which lit-up the Earths night-side ionosphere to day-side levels, punctuating the discovery of a second magnetar in SGR 1900+14 . "X-ray Spectral Characteristics of GINGA Gamma-Ray Bursts"
While at Los Alamos I worked on a study of the X-ray spectral properties of gamma-ray bursts. Take a look at the paper which describes the X-ray spectral properties of a sample of Gamma-ray Bursts observed with the burst detector which flew on the Japanese X-ray astronomy satellite GINGA. 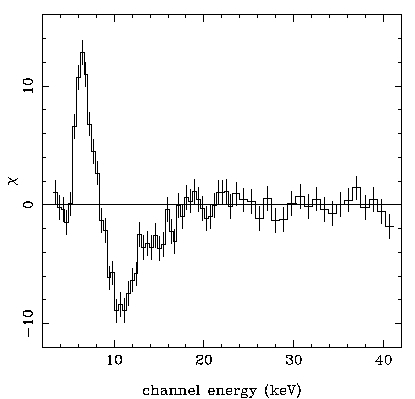 X-ray Spectral Properties of Gamma-ray Bursts . The newest X-ray astronomy missions, such as NASA's recently launched Chandra X-ray observatory and European Space Agency 's (ESA) soon to be launched X-ray Multiple Mirror Mission (XMM) are powerful tools for high resolution spectroscopy of X-ray sources. With colleagues Jean Swank, Craig Markwardt and Tim Kallman I am studying accreting neutron star binary systems and bursters with the high resolution spectroscopic capabilites afforded by these new X-ray observatories.